Margo is one volunteer who had a few years of experience with TNR prior to beginning with HCMT through managing a colony, trapping, spaying or neutering and returning adults to the area behind her workplace and socializing and adopting out the kittens, and once she joined up with HCMT she is at it every day with fostering, transporting, trapping, planning as well as volunteering for clinics and even serving on the board. In summer 2013, though, one of the cats in her colony was sick but she couldn’t trap him. She posted about him on Faceboook and someone suggested HCMT so she got in touch, and became a member of the group Pittsburgh Feral Cat Movement. It turned out that the cat was friendly and she was able to just pick him up and put him in a carrier. The cat she named Gnarly was even social enough that she found a home for him on a farm but not as a feral, as a pet with a little human girl all his own. She kept up with comments and events in the group but didn’t get involved until one day an urgent request went out for a foster for 11 very sick kittens with horrible eye infections who had been pulled from a home. One died, another had to be euthanized. All the foster homes were full and there was no place for the kittens to go. “I sat there for a couple minutes and then was like, that’s it, I’m in. They divided them into 2 litters , I got the litter of 5 delivered to me that evening. And that was it….I was hooked ,” Margo said of how she began volunteering for the group. And like most others who start volunteering with this group she hit the ground running and was soon not only fostering very ill kittens with complicated medical care, but also trapping in other places or helping others trap, transporting from rescue to foster homes to clinic to shelters, distributing food and winter shelters and volunteering for clinics. Margo always seems to have a mom cat and a littler of kittens, or two, or three…and she obviously enjoys that most. She also does well with very sick kittens both in healing them and in finding solutions for how to care for conditions she’s never dealt with. When a litter she trapped turned out to have ringworm she set up an isolation cage in her garage and wore covers over her clothes to care for and socialize the kittens and managed to keep everyone, including herself, clean of the infection. Of that very sick first litter she fostered, each kitten needed warm compresses three times each day with two different eye medications and oral antibiotics. “We were sure the one guy would lose his eye, but he didn’t!” she said. In 2014 she fostered 26 kittens and cats, and estimates a total of 45 since that first litter in 2013. As far as trapping efforts, she’s just not sure how many cats she’s trapped, but it’s a lot! And you never know what the challenge will be in any situation because unexpected situations and kittens always come up. “I did have one amazing project where I along with another volunteer trapped over 20 cats in one day,” she said. “It took 18 hours but we got them! About 4 hours into trapping we found newborn kittens (only about 3 days old) and didn’t know who or where the mom was. So for the next 14 hours we bottle fed them in my truck, then I took them home and bottle fed overnight. The next day when the cats were getting fixed we were able to find the lactating mom, then later that night the kittens were reunited with the mom.” As everyone likes to say when a situation is handled well, “Solutions!” The caretaker fostered those kittens and then the rescue assisted with getting them adopted out. In the past month alone Margo has done lots of driving, delivering cats from one place to another, fostering a mom and 4 kittens, fundraising, worked the table at the Catstravaganza fundraising event and helped promote the Painting With a Twist event she organized, helped an older woman who doesn’t drive with getting her cats fixed, and this Saturday is trapping at a local colony of at least 15 cats that are thought to be there, then transporting them to the clinic and working the clinic all day Sunday. “My family is AMAZING,” she says of the support she gets for her volunteer efforts on behalf of cats. “My husband is a quiet supporter, and I’m sure sometimes he’s less than thrilled when I tell him, ‘You can’t use the garage for the next 3 days, there are feral cats in there recovering,’ but he goes along with it.” He also visits with the fosters and has even helped by picking up a cat or 2 that has needed transported, and picked up a large donation of canned food from a shelter. Margo’s mother and father “can’t be beat. They support me 100%.” Her mother always donates when Margo gets new fosters or if a foster needs medical attention, or she’ll show up with new kitten toys and food. “I am very lucky, I currently still have all the cats that I’ve had in my life,” she said. Growing up with dogs and horses Margo loved the barn cats along with pretty much any other animal. She adopted her first pet cat in 2007 when she found two brother kittens at the Animal Rescue League who she named Jake and Joey, Then she kept a kitten from one of the litters she fostered from her workplace and named her Delilah. In fall of 2013 she rescued and fostered an emaciated but friendly orange boy who was dumped at a grocery store. She could find no one to adopt him but he bonded with Margo’s husband, so Finn makes the fourth member of her family of “house cats”. Like most volunteers her day job is not at all animal related, in fact it’s nowhere even near working with animals. She is the Vice President of Cicci Dance Supplies which designs and manufactures dance costumes. But even in that she manages to incorporate her passion for saving cats into her career. Her company has a big convention in Pittsburgh each year and she hosts a Cat Food and Toy Drive. In 2014 over 200 pounds of dry food were donated and over 200 cans of wet food along with lots of toys! 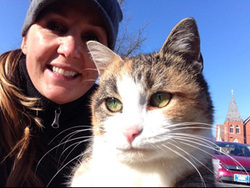 The kitty in the photo with Margo is Auntie who is one of the feral cats at her workplace but who each year grows more friendly, especially after she had developed a deep viral infection in early 2014 and Margo brought her indoors for treatment. Auntie was so sweet Margo didn’t want to put her back outside and thought she might be able to adopt her to someone understanding, but that didn’t work for Auntie. Auntie has continued to be more friendly over the past year, though, came in again this winter and stayed in for a little longer. It may be that someday she comes in for good, something that’s not typical with feral cats. One little rescued kitten from a complicated trapping project took a piece of her heart, though. A litter of kittens was seen near a dumpster behind a restaurant, and with all her skill with trapping she visited there for weeks and set traps and could not catch a single one. There was no caretaker and one kitten was limping, winter was coming, she felt she had to catch them and the mother cat. One night she decided to started trapping late, at 9:00 p.m., determined to stay there all night if that would catch the family. She had seen four kittens and finally at midnight she had trapped four kittens. When she went behind the dumpster to close the last trap there was the Mom in it, and on the outside of the trap was a tiny little black kitten she’d never seen in all those weeks pawing at his momma in the trap. He ran when he saw Margo….her heart sank. It was very cold out and she couldn’t leave him there alone but was afraid she wouldn’t get him. She called another volunteer to bring another trap and set it at 12:30 and finally after 1:00 AM they had trapped him. They were all fixed and diagnosed with ringworm, and that was when she set up her garage for them to stay in quarantine. The limping kitten, Josephine, had a dislocated shoulder on her xrays, but would most likely “heal” on its own and all was good. But after about a week she could see that last little black kitten, Johnny, wasn’t doing well. He had ringworm the worst, but he was just never like the rest of the kittens. Even after several inconclusive vet visits and treatments he really declined the day after Thanksgiving and she knew she’d have to make a decision when his suffering was too much. “I only had him for 19 days, but he took a piece of my heart with him,” she said.